$2,100,000 Contemporary and open design! Casa de Mar is located in the exclusive gated community of Dulce Vida, part of the development of Hacienda Pinilla, a 1,800 hectare gated community just one hour away from Liberia International Airport. 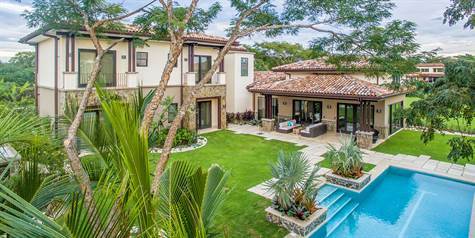 There are only twenty-four properties in Dulce Vida and Casa de Mar is located along the amazing 14th hole of the golf course. It is the perfect place if you just want to enjoy nature and be filled with tranquility and peace. The house was beautifully designed taking into consideration its surroundings and maintaining an open concept throughout the house. As soon as you start walking through the different areas of Casa de Mar, you will find that natural sunlight is present in every corner of the house, allowing you to feel full of energy at any time on the property. The ground floor consists of two large bedrooms, each with private bathroom, dressing rooms and private terraces overlooking the gardens. The kitchen and living room have high ceilings and large sliding windows that open onto the patio and pool area with views of the golf course. The kitchen has granite countertops and beautiful wood cabinets. The second level has a large common area, two large bedrooms, each with a private bathroom and balcony, overlooking the golf course and gardens.